Summer is so close to being over. In just a few short days everyone will swap out their fresh tomatoes and berries for pumpkin and apple everything. Don’t get me wrong, I am just as obsessed with Fall and all the seasonal baking that comes along with it, but before we jump into that, let’s continue to savor the last little bits that summer has to offer. I can’t think of a better way to hold onto summer than by whipping up a batch of this walnut summer squash pesto. It comes together in less than 5 minutes and is so versatile. Throw it on pasta, spear it on a sandwich, cover your favorite salad, or even use it as a veggie dip — the possibilities are endless. Place all ingredients in a food processor and blend until well combined. It’s that simple! Store in the refrigerator for up to a week. When I was in high-school there were multiple occasions where I wanted to lose weight quickly. Because I'm a typical American and lacked any education on how to lose weight in a healthy way, I attempted this diet called "the cabbage soup diet". There are a lot of variation of it and you can read about the basics here, but essentially you eat a cabbage based soup and little else for like seven days in hopes of losing 10 pounds. Totally magical! Or maybe not. Almost every attempt left me cranky by day 3 (because I just needed a gosh dang piece of meat!) and I would find myself giving up all together. A series of unhealthy eating patterns such as these cascaded into a long period of skewed body image and disordered eating, but that's a longer story for another day. Fast forward to now. I have a much different relationship with food -- better, most days. Not perfect and still evolving, but better. Because my relationship with food had changed, it took me a very long time to look at cabbage as a food that could actually taste good and I could healthfully eat. After those many cabbage soup diet attempts in which I started out viewing the cabbage as the-have-all-end-all and ultimately found myself despising, letting go of those feelings was difficult for me. I was afraid that if I ate cabbage at all, a lot of that disordered food relationship would resurface. I don't remember the first time I decided I would start eating cabbage again, but one day I decided to give it a shot. I had it roasted. The moment I put it in my mouth I completely rethought everything I knew about cabbage. I completely forgot about how horrible it tasted by day three of that dreaded diet, but I also didn't see it as a key to getting myself to fit into a particular dress size. I just ate it as food, and it was good. If you too connect cabbage to the cabbage soup diet (and days in a row of starvation) or just have never found cabbage to be the greatest of vegetables, I encourage you to try this recipe. You might just find a completely new, healthy relationship with it. In a small bowl, combine the olive oil, grainy mustard, and honey. Place the wedges on a large baking sheet. 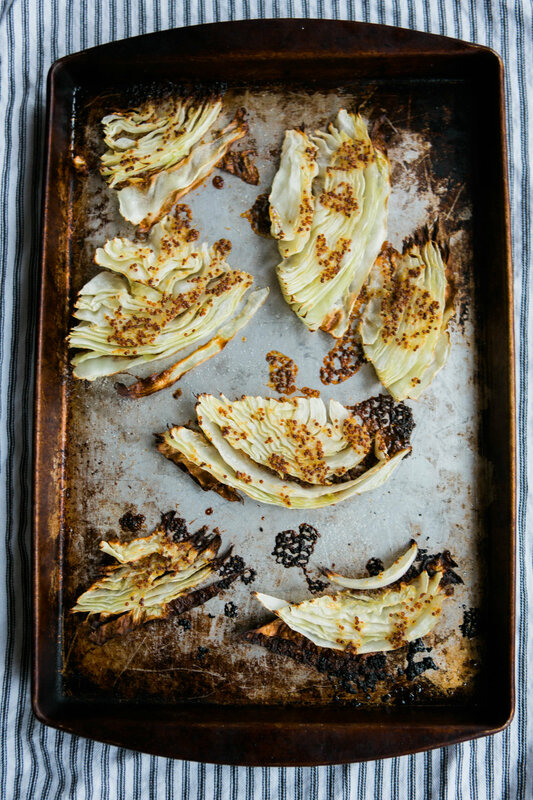 Brush the top of the cabbage wedges with the honey mustard oil mixture. Season with salt and pepper to taste. Place the baking sheet in the oven and bake for 20 minutes or until the edges have browned as pictured above.